In a medium bowl, combine all ingredients except fillo shells and graham crackers. Stir until uniform. Cover and refrigerate for 1 hour, or until chilled. Bake shells on a baking sheet until lightly browned and crispy, about 5 minutes. Just before serving, evenly distribute filling into the fillo shells. Sprinkle with crushed graham crackers. HG Tip: If you're not serving these the same day they're made, store the baked fillo sheets at room temp in a sealable container or bag, and refrigerate the filling in a sealed container. 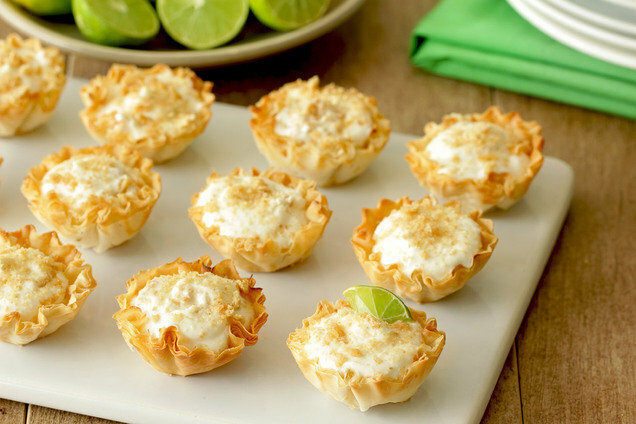 Hungry for More Low-Calorie Mini Desserts? Happy National Kitchen Klutzes of America Day, June 13! If you know someone who could use a few helpful tools, send them this list (or do some impromptu gifting!). Share this recipe with all the pie fanatics in your life... Click "Send to a Friend" or forward it now!